F1 in Schools, the Formula One™ Technology Challenge, celebrated a fourth successful World Championships in Malaysia this year, and this global educational programme is now operating in 30 countries, reaching over 9 million students. A review of the 2008 World Championship event and an overview of F1 in Schools has been launched with an attractive brochure viewable at the F1 in Schools website, and a printed version available by request online. The UK F1 in Schools website also has a fresh new look, providing students, teachers and participants with all the information on the programme at their fingertips. The new brochure is beautifully illustrated, conveying the professionalism, international scope, excitement and experience that F1 in Schools offers students. It charts the history of the programme, explains the disciplines covered, highlights the close links that F1 in Schools enjoys with the Formula One™ fraternity and details all the winners at the 2008 World Championships. The F1 in Schools website for the UK programme has recently re-launched, with a home page full of news and pictures. The site is a gateway to extensive resources, information, rules and regulations, providing participants with everything they need to compete in the multi-discipline challenge. Additional secure areas of the site allow close communication between the F1 in School organisers and participating teams, with interactive information exchange. The site is at http://www.f1inschools.co.uk/. The new brochure, entitled Online Executive Summary, can also be viewed here, and requests for a printed version can be submitted by completion of the ‘Contact Us’ form. F1 in Schools is a global multi-disciplinary challenge for students aged from 9-19 to use CAD/CAM software to design, analyse, manufacture, test and race their miniature F1 car made from balsa wood and powered by compressed air cylinders. Working in teams of between three and six, the students prepare a business plan, develop a budget and raise sponsorship as well as designing and racing their car. The challenge inspires students to learn about science, maths, aerodynamics, design, manufacture, branding, graphics, sponsorship, marketing, leadership, teamwork, media skills and financial strategy, and apply them in a practical, imaginative, competitive and exciting way. The 2008 F1 in Schools World Champions, Team Pulse from Devonport High School for Boys, Plymouth, will be rubbing shoulders with royalty and VIPs from the business world at a UK Trade and Industry event to be held at St. James’s Palace, London on Thursday evening. The victorious team of four boys: John Ware, 16, Samuel Wood, 15, Andrew Lees, 16 and Thomas Simpson, 17 fought off competition from 24 teams from 15 countries at the F1 in Schools World Championships in Malaysia to lift the Bernie Ecclestone World Championship trophy and claim coveted BEng Automotive and Motor Sport Engineering scholarships at City University London. F1 in Schools is a global multi-disciplinary challenge for students aged from 9-18 to use CAD/CAM software to design, analyse, manufacture, test and race their miniature F1 car made from balsa wood and powered by CO2 cylinders. Working in teams of between three and six, the students prepare a business plan, develop a budget and raise sponsorship as well as designing and racing their car. The challenge inspires students to learn about physics, aerodynamics, design, manufacture, branding, graphics, sponsorship, marketing, leadership, teamwork, media skills and financial strategy, and apply them in a practical, imaginative, competitive and exciting way. The prestigious event which Team Pulse will be attending has a VIP guest list including Prince Andrew, Duke of York; Rt. Hon. Lord Jones of Birmingham; Sir Martin Sorrell, Sir Jackie Stewart and Damon Hill. The reception will promote two iconic British industries – motorsport and the creative industries, and showcase the synergies between the two. The F1 in Schools Technology Challenge aptly demonstrates this, with the student teams including a graphic designer responsible for the website, presentation and marketing materials which are produced as part of the competition. Design within the engineering process is also an integral part of the competition. The British round of the Formula One World Championship may have hosted the stars of F1 and celebrities from TV and films, but Silverstone was also the destination for motor racing champions from F1 in Schools, an inspirational national and international student challenge. Students from the winning F1 in Schools at the National Finals held in Birmingham earlier this year were given a rare insight into this prestigious and glamorous event, courtesy of Silverstone Circuit and Formula One, including grandstand passes and tours of the VIP area – the Formula One paddock. Some of the teams were also lucky enough to visit a team garage. Pulse, a team of students from Devonport High School, Plymouth, were crowned World Champions during the Malaysian Grand Prix in March this year. 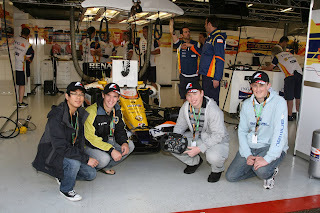 The students were given a tour of the BMW Sauber F1 team garage by the team’s test driver, Christian Klien. As reigning champions, they’ve also been living life in the fast line. In a star-studded week, the students enjoyed three unique occasions – being given a VIP tour of the House of Commons, meeting HRH Prince Andrew in St. James’s Palace at a UK Trade and Investment event, and being given an F1 garage tour. They also have another treat this week, a trip to the McLaren Technology Centre in Woking. Team Blaze from Ynysawdre School in Wales won their taste of this exclusivity after being crowned F1 in Schools National Champions at the 2008 finals in Birmingham earlier this year. They had the privilege of spending some time in the paddock and the Renault F1 team, with the highlight of their visit being a tour of the team’s garage to see the cars being prepared for the British Grand Prix. Hippos Strike Back, a team from St.Gregory the Great School, Oxford, were winners of the 11-14 years age group at the National Finals and they were delighted to visit the McLaren garage and pit area. Meanwhile, Spectrum, a team from Robert May’s School in Odiham, toured the Toyota garage and were given a very detailed insight into the workings of the team and its powerful engine. Primary school students from County Atrimm, the Antrim Griffins won th e Juniors National title. Although they were not able to see behind the scenes in a team garage, they were photographed with a host of stars including Ross Brawn from Honda Racing F1 team, Louise Goodman from ITV, Mark Blundell, ex-F1 racer and commentator for ITV, as well as HRH Duke of Kent and Sir Jackie Stewart. F1 in Schools is a global multi-disciplinary challenge for students aged from 9-18 to use CAD/CAM software to design, analyse, manufacture, test and race their miniature F1 car made from balsa wood and powered by compressed air cylinders. Working in teams of between three and six, the students prepare a business plan, develop a budget and raise sponsorship as well as designing and racing their car. The challenge inspires students to learn about science, maths, aerodynamics, design, manufacture, branding, graphics, sponsorship, marketing, leadership, teamwork, media skills and financial strategy, and apply them in a practical, imaginative, competitive and exciting way. Andrew Denford, Chairman and Founder, F1 in Schools, addressed delegates at this week’s Motor Sport Business Forum Middle East in Bahrain to encourage further support from the industry for the Formula One in Schools Technology Challenge. 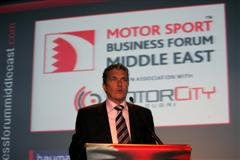 The Motorsport Business Forum Middle East held at the impressive Bahrain International Circuit was the first of its kind outside of Europe and aimed to bring together professionals from the industry to discuss and debate key issues, with particular reference to the Middle East region. The role of the F1 in Schools programme within the rapidly expanding motor sport industry in the region was made clear from many of the speakers during the two day event. There was a clear understanding that facilities such as the Bahrain International Circuit and the national racing series need to nurture young talent, whether that is drivers, mechanics or engineers. Following on from the keynote address by Ron Dennis (Chairman & CEO of McLaren Group), Andrew Denford was able to explain the concept of F1 in Schools and introduce the audience to the success which has been achieved through the programme, which spans 29 countries across the globe, engaging over 350,000 students and being part of the reversal of a declining trend in students studying engineering at higher levels of education. The F1 in Schools programme is already established in Kuwait, and with the growth of the motorsport industry, particularly within the Gulf region, and the Qatar, Bahrain, Dubai and Abu Dhabi circuits, F1 in Schools is soon to launch a middle east expansion in 7 countries in partnership with Union Properties and the F1X in Dubai and is sure that this will be reflected in the increased participation in the initiative. The F1 in Schools Technology Challenge is for school children aged 11 to 18 to use CAD/CAM software to design, analyse, manufacture, test and race their miniature F1 car made from balsa wood and powered by CO2 cylinders. The challenge inspires students to use IT to learn about physics, aerodynamics, design, manufacture, branding, graphics, sponsorship, marketing, leadership, teamwork, media skills and financial strategy, and apply them in a practical, imaginative, competitive and exciting way. The 2008 World Championships recently took place in Kuala Lumpur, Malaysia during the build up to the Petronas Formula One™ Malaysian Grand Prix at the Sepang International Circuit. Over three days of enthralling competition, 25 teams pitted their small scale miniature F1 cars against each other along a 20-metre two lane track at a scale speed of over 220mph. School children from 29 nations across the globe won their way through regional and national finals, and competed against a global reach of 7 million students, to win the chance to represent their countries in the fourth annual World Championships. Team Pulse, from Devonport High School for Boys in Plymouth, England, were crowned winners, taking home the prestigious Bernie Ecclestone World Championship Trophy and BEng Automotive and Motor Sport Engineering scholarships at City University, London. Team Pulse from Devonport High School for Boys, Plymouth, UK have lifted the Bernie Ecclestone Trophy as they were crowned 2008 F1 in Schools World Champions at World Championships in Kuala Lumpur, Malaysia. John Ware, 16, Samuel Wood, 15, Andrew Lees, 16 and Thomas Simpson, 17 fought off competition from 24 teams from 15 countries to claim the coveted BEng Automotive and Motor Sport Engineering scholarships at City University London. After 12 months of intense competition from over 7 million students, Team Pulse battled their way through regional and national finals to reach the World Championships. Here in Kuala Lumpur, the five lads from Plymouth competed against students of 28 nationalities across Australia, Europe, Asia, America and the Middle East in three days of intense competition. Team Pulse also won the ‘Fastest Car’ award clocking a time of 1.064 seconds, just shy of the world record set by Team Fuga of Northern Ireland last year at 1.020 seconds. Several of the teams blamed the slower times on the humid conditions which increased the moisture in the air, and in some cases added weight to the miniature cars. The judges said Pulse scored well with an impressive portfolio and clinical presentation as well as winning the knock out challenge on Thursday morning to clinch the highest points total and scoop the title of “2008 World Champions”. As part of their prize, Team Pulse will attend the Petronas Formula One™ Malaysian Grand Prix at the Sepang International Circuit and have access to the prestigious Formula 1 paddock where they can rub shoulders with Lewis Hamilton, Kimi Raikkonen and Fernando Alonso as well as having a tour of the pits and garages. Second and third places on the podium were locked out by Australia. Goshawk from the Trinity Christian School, ACT, Australia took second place as well as The Best Engineered Car Award while team mates and Australia National Champions Impulse F1 from Barker College, New South Wales sealed third spot. UK National Champions scooped the Innovative Thinking Award after the judges were impressed with their computer controlled air tunnel and The Best Newcomer Award went to Team Pitomia of France. Team Hybrid, a partnership between Scotland and USA, won Best Collaboration Team for the second successive year while Team Blaze from Ynysawdre Comprehensive School flew the flag for Wales when they won Best Team Identity Award. Singapore’s Sonic_T won Best Sportsmanship Award. The National Champions took Polaroid pictures of themselves with all of the competing teams and then put them in a scrap book where fellow teams wrote messages of friendship. The Excaliburs, a collaboration between Bildunf Fur Technik und Natur, Germany and SMK Seksyen 9, Malaysia were presented with the Perseverance in The Face of Adversity Award. On Monday, one of the team members was taken to hospital and underwent major surgery but despite this, just two days later, she returned to support her team mates and complete her part of the verbal presentation. The F1 in Schools Technology Challenge is for school children aged 11 to 18 to use CAD/CAM software to design, analyse, manufacture, test and race their miniature F1 car made from balsa wood and powered by CO2 cylinders. The 2008 World Championships took place at the 5* Sunway Lagoon Resort and Spa Hotel in Kuala Lumpur, Malaysia from 18th to 20th March 2008, during the build up to the Petronas Formula One™ Malaysian Grand Prix at the Sepang International Circuit. Over three days of enthralling competition, 25 teams pit their small scale miniature F1 cars against each other along a 20-metre two lane track at a scale speed of over 220mph. Chief Executive of The Formula One Group Bernie Ecclestone has crowned England’s Team Pulse 2008 F1 in Schools World Champions. John Ware, 16, Samuel Wood, 15, Andrew Lees, 16 and Thomas Simpson, 17 were presented with the Bernie Ecclestone Trophy by Mr Ecclestone himself during a presentation in the Malaysian Grand Prix F1 paddock. The four-man team from Devonport High School for Boys, Plymouth, UK fought off competition from 24 teams from 15 countries to claim the coveted BEng Automotive and Motor Sport Engineering scholarships at City University London. As part of their prize, Team Pulse attended the Petronas Formula One™ Malaysian Grand Prix at the Sepang International Circuit and had access to the prestigious Formula 1 paddock where they met a whole host of F1 personalities including Lewis Hamilton, Jenson Button, Fernando Alonso. The team also enjoyed a tour of the Renault F1 pit garage and an informal chat with Honda Team Principal Ross Brawn in the Honda F1 hospitality suite. Watch the World Championships LIVE! The 4th F1 in Schools World Championships will be held next week, 18th – 20th March at the 5* Sunway Lagoon Hotel, Kuala Lumpur, Malaysia. Twenty five teams from all over the world will be competing for the Bernie Ecclestone World Championship Trophy and BEng Automotive and Motor Sport Engineering scholarships at City University London. WATCH ALL THE ACTION... LIVE!!!!!!!!!!!!!!!!!!!!!!!! YOU can watch the action LIVE, from your classroom, home or office, from anywhere in the World !! Watch and Listen! - Live model F1 Car racing, live score card, tour the Team Displays, interviews with Student Team members, verbal presentations. Also tune into the official Opening Ceremony and Gala Awards Presentation to see who is crowned World Champions for 2008! To watch this amazing event from the other side of the world follow this link to our hosts website http://www.f1inschools.com.my/ and click on the banner link to the webcast. If you are in the UK, Malaysia is 8 hours ahead. The times on our hosts website are in Malaysian Time. It WILL be worth staying out of bed for!!!!! !